Do you know what the following graph represents? Triggle is a portmanteau, a combination of two or more words and their definitions. you might say that it has suffered from zerosion — the removal of a term because of multiplication by zero. The following portmanteaux may be useful for your next math discussion. 1 It came to my attention after the publication of this post that Gridiculous is (a) a trivia game developed for Windows 8 and (b) an HTML5 responsive grid boilerplate (though the link to the site seems not to be working). I am forever indebted to Tetsuya Miyamoto for inventing KenKen, and I am deeply appreciative that Nextoy, LLC, brought KenKen to the United States. How else would I wile away the hours between sunrise and sunset? I am also extremely grateful that the only thing Nextoy copyrighted was the name KenKen. 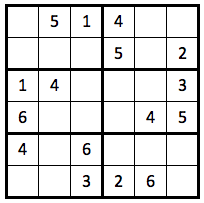 This allows Tom Snyder to develop themed TomToms, and it allows the PGDevTeam to offer MathDoku Pro, which I believe to be the best Android app for playing KenKen puzzles. 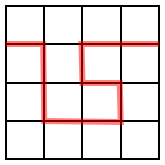 The most recent release of MathDoku has improved numerical input as well as a timer. Consequently, my recent fascination is playing 4 × 4 puzzles to see how long it will take. A typical puzzle will take 20‑30 seconds; occasionally, I’ll complete a puzzle in 18‑19 seconds; and, every once in a while, I’ll hit 17 seconds… but not very often. The screenshot shows that I completed the puzzle in just 15 seconds. And it’s not even photoshopped. The [11+] cell can only be filled with (4, 3, 4). The  in the first column dictates the order of the (1, 4) in the [4×] cell. The (1, 4) in the [4×] cell dictates the order of the (1, 2) in the [3+] cell. 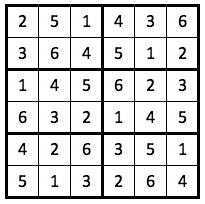 After that, the rest of the puzzle falls easily into place, because each digit 1‑4 occurs exactly once in each row and column. 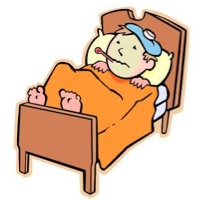 The holiday break is nigh, which means you need to be careful not to catch a cold. For many people, the time preceding a holiday, vacation, or spring break is busy — finishing up a term paper, completing holiday shopping, or getting things off your desk so you can enjoy your trip to Tahiti. During that time, your immunity kicks into high gear. It helps to fend off germs while you’re pushing yourself to get stuff done. When your break finally comes, though, you relax, and your body thinks, “Oh, cool, the stress is over.” And BAM! No more immunity, and your body succumbs to infection. Sniffles, headache, and a cough ensue. That’s right. You can trick your body into thinking that you’re still stressed by doing crosswords, sudoku, nurikabe, battleship, nonogrids, or whatever you like. Your mind is working hard, so your body keeps your immunity up. Doing something you enjoy fends off disease. Win-win. Well, MJ4MF is here to help. The following SudoClue puzzle will provide a half-hour of much-needed stress. The idea is rather simple. 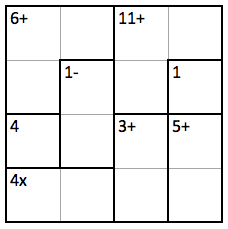 Use the clues to fill in the corresponding squares of the 6 × 6 grid, then fill in the remaining squares like a sudoku puzzle. 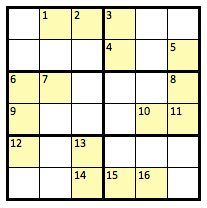 The puzzle below, as well as an easier version, are available in PDF format. Don’t feel like thinking too much on holiday break? Fine, here’s a hint. And if you’ve already fully entered holiday break mode, here’s the solution. Create a 4 × 4 grid composed of common English words (you can use the list of official Scrabble four‑letter words as a reference) such that the sum of the point values of the 16 letters is as high as possible. I am certain that a better solution exists, but I have neither the time nor the energy to search for it. Anyone out there want to write a computer program to solve it? ** UPDATE (1/14/11): Check out the comments section from the previous post. Veky Edgar wrote a computer program and found the maximum possible score (92 points), and Scandinavian manually created a grid worth 85 points.